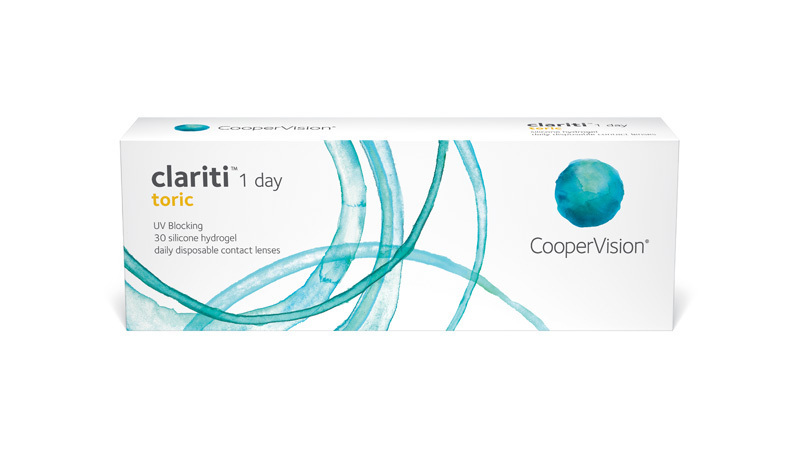 Now your astigmatic patients can enjoy all the convenience of a daily disposable and the healthy advantages of silicone hydrogel in one lens—clariti™ 1 day toric from CooperVision. Winner of the Contact Lens Product of the Year at the 2012 Optician Awards**, clariti 1 day toric is the only silicone hydrogel, daily disposable contact lens for astigmatism available today. For your patients, silicone hydrogel means whiter eyes and a healthier*** lens-wearing experience. The clariti 1 day lens allows 100% corneal oxygen consumption****. In fact, it provides more than the recommended amount of oxygen***** across the entire lens surface to help maintain ocular health. And for your practice, you’ll appreciate that clariti™ 1 day toric features the broadest power range of any daily disposable lens in the world. With clariti™ 1 day toric, you’ll be able to fit more patients and expand what your practice has to offer. CooperVision clariti 1 day toric features WetLoc™ technology, a process that creates a hydrophilic lens with optimal wettability. WetLoc is a non-surface treatment technology that manipulates the structure of hydrophobic silicone molecules so they become hydrophilic. This creates a lens that naturally attracts and binds water molecules, holding them tightly to the lens surface. WetLoc also provides continuous wettability throughout the wearing time. The result is a lens with high water content****** that provides excellent all-day comfort for your patients. Talk to your patients about the healthy advantages and daily convenience of clariti 1 day toric. It’s the world’s only SiHy daily disposable lens for astigmatism and features the broadest power range of any daily disposable lens. **Awarded by Optician, a leading UK optometric publication, as voted for by a panel of recognized UK Eye Care Professionals. ***Data on file; clariti™ 1 day offers whiter eyes than 1-DAY ACUVUE® MOIST®. ****Brennan N.A. Beyond Flux: Total Corneal Oxygen Consumption as an Index of Corneal Oxygenation During Contact Lens Wear. Investigative Ophthalmology & Visual Science. 2005; 82:467–472. *****Holden B.A., Mertz GW. Critical oxygen levels to avoid corneal edema for daily and extended wear contact lenses. Investigative Ophthalmology & Visual Science. 1984; 25:1161. ******Manufacturer’s quoted core water content.